For the crust- Mix the crumbs and the butter until damp. Press firmly into the bottom of a 9 inch springform pan. Set aside. In a large bowl, slowly cream together the chocolate, cocoa, sugar, cream cheese and vanilla. Add the eggs and sour cream, mix thoroughly. Pour into prepared pan. Allow to sit 2 minutes, then tap the pan on the counter to encourage any air bubbles to come to the surface and burst. Bake 2 hours or until the surface is mostly set- the middle inch or so might still look not even less set, almost jiggly**. Remove to the counter and run a knife or thin spatula around the edge of the pan. Allow to cool to room temperature, then refrigerate until firm. Refrigerate leftovers. *Pulse halved cookies in a food processor until they resemble coarse sand. **Overbaking or poking the center might result in a crack. Resist the urge. Alternately, cover or cut around the crack. This is the ne plus ultra of chocolate cheesecakes. It is not the time for calorie counting, weight-watching, using low fat products or for the faint of heart. Cheesecake is always impressive (despite being relatively uncomplicated to make) to serve to guests and chocolate cheesecake even more so. 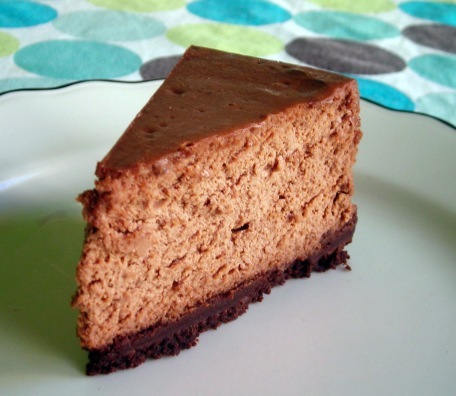 I generally avoid ordering chocolate flavored cheesecakes in restaurants because I find that they are often just a regular cheesecake with a slight cocoa flavor. That's not a problem with this cheesecake. The chocolate flavor is very strong and is accentuated by the very dark chocolate crust and the tang of the cream cheese and sour cream. The sour cream also keeps the cheesecake from becoming too firm or overly dense. The combination of 85% dark chocolate and cocoa result in a complex chocolate flavor that is unlike any I've had in a cheesecake. Note: The intense chocolate flavor eliminates the need for sauces or a topping of any kind, but if you are the gild the lily type, a dollop of whipped cream would not be out of place. Line two baking sheets with parchment paper. Preheat the oven to 250. Toss all ingredients (except the salt) together. Make sure the nuts are evenly coated. Arrange in a single layer on one of the baking sheet and bake 30 minutes, or until the almonds look mostly dry, stirring every 10 minutes. Remove from the oven, sprinkle and allow to cool on the remaining lined baking sheet in a single layer. 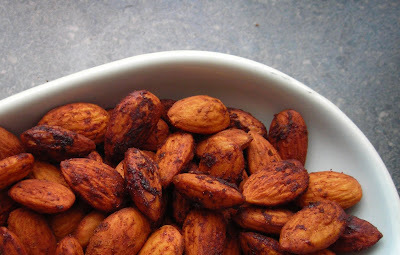 This recipe is a great way to get the smoked almond flavor without a smoker. They aren't too spicy and would be wonderful at a cocktail party. WARNING: this must be done a minimum of 2 hours before you want to bake the cookies. Combine butter, sugars and vanilla and beat until fluffy. Add the espresso, eggs and mix. While the mixture is beating, add the cocoa, flour, baking powder and salt. Mix on until incorporated. Using a spatula, scrape the dough (it will be very thick and rather sticky) on a large piece of plastic wrap. Shape into a approximately 2 inch thick log. Wrap tightly in plastic wrap. Refrigerate the dough until it is firm (about 2 hours) or overnight*. Preheat the oven to 350. Line 2 cookie sheets with parchment paper. Unwrap the dough and cut into 1/4 inch slices using a serrated knife (a bread knife works well). If the dough begins to soften as you cut, return it to the refrigerator to chill until it is firm again, normally about 5-10 minutes. Arrange the slices on the cookie sheets about 1/2 inch apart. Bake about 12 minutes or until they are just starting to brown on the bottom and the sides are no longer shiny. *You can actually keep the dough refrigerated for a week or so, slicing off as many cookies as you want to eat at a time. Tip: Decorate the cookies by rolling the log of dough in coarse sugar or nonpareils before slicing. Today was one of those times when I went into the kitchen to make one thing (in this case, chocolate shortbread) and instead ended up making something totally different- rich, dark chocolate slice and bake cookies. I wanted an intensely chocolate cookie, but the thought of using a whole cup of butter for shortbread wasn't very appealing. So I just made the recipe up as a I went along and realized that this was a cookie batter that would benefit from some refrigeration. These cookies are mostly crisp, with a slightly soft center and an intense chocolate flavor that enhanced by a touch of espresso. A little history for you. Icebox cookies first became popular when (surprise!) iceboxes and refrigerators became popular in American homes. Manufactures often included a booklet of recipes that required food to be refrigerated before eating with the purchase of a new refrigerator or ice box. The new technology meant that home cooks didn't have to bake an entire recipe of cookies at once, nor did they have to make the batter and bake the cookies on the same day which could be a bit of a time saver. Tip: Have extra cookies? I used them as a crust for this yummy cheesecake. Melt the butter in a large pot . Add cabbage and sprinkle with salt. Saute until it is just beginning to wilt, about 8 minutes, stirring occasionally. Add the sugar and vinegar, stir to coat evenly. Reduce heat and cover Cook an additional 30 minutes or until the cabbage has cooked down considerably and is very tender. Normally I would shred the cabbage, but as my thumb now sports a large scar from a tragic sauerkraut making mishap, thinly slicing seemed safer. Either method would work though. My favorite dish to serve with with is sauerbrauten (recipe currently in creation) but I made a roasted chicken tonight and served it with that instead. Yum. I love pickly foods. Preheat oven to 350. Line or grease and flour one 12 well muffin tin. In a large bowl, mix together the oatmeal, egg, oil, milk, and sugar. After it is thoroughly mixed, add in the flour, salt, ginger, and baking soda. Stir to combine. Fold in the gooseberries. Divide evenly amount 12 muffin wells. 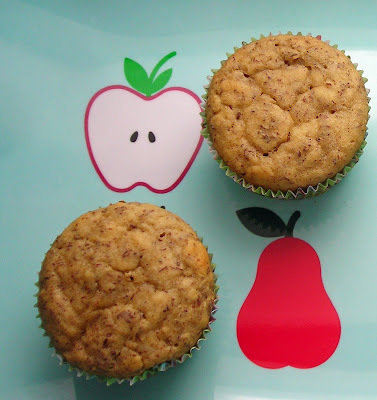 Bake 15-20 minutes or until a toothpick inserted in the center of the center muffin comes out clean. Cool on a wire rack, serve. *A lot of gooseberries sold in the US are actually unripe. Ripe gooseberries, which are a lot less tart, are reddish, while the unripened ones are green. I used a mixture of both for this recipe. On my food wishlist on Food Maven, I mentioned that I was on the look out for gooseberries. I didn't have have luck finding them at the farmers market this year and figured I'd have to wait a while and then try again. Then I got an email from Peter of the Cherry Hill Farm in Vermont. He said that they had planned to add a gooseberry jam to the list of preserves they make and sell but didn't actually do it. As a result they had several pounds of frozen gooseberries they offered to send me. Of course I jumped at the chance and a few days later, a slightly sticky box arrived. Some were a bit worse for the wear but I was able to salvage some and make these muffins. The result-not to sweet not too tart berry muffins. Preheat oven to 350. 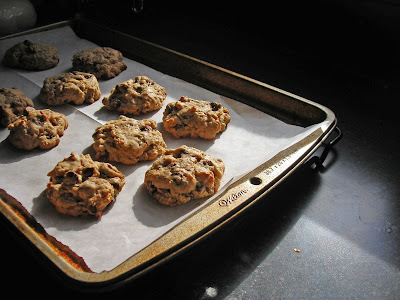 Line 2 cookie sheets with parchment paper. In a large bowl, cream together the butter, vanilla and sugar. Add the egg, beat until fluffy. Add the flour, baking powder, salt, and oatmeal. Mix until well combined. Fold in toffee bits and chips. Place tablespoon sized blobs of dough on the lined cookie sheet about 1/2 inch apart and bake for 12-14 minutes or until they look "set" and the bottoms are just golden. Carefully remove to a wire rack to cool completely. I like making oatmeal cookies because I can almost trick myself into thinking they are health food. Almost. But oats are whole grains and I only used 4 tablespoons of butter to make 24 cookies which (if my feeble attempt at math is correct) means there is only 0.166 of a tablespoon of butter in each cookie. We'll just ignore the sugar and chips. But really, I made them to cheer myself up after a rough day. The toffee adds a bit of "chew" to each bite which makes them just a little bit different than the usual chocolate chip oatmeal cookie. The toffee chips do make the cookies slightly sweeter than I normally make (I like to err on the "less sweet" side of baking) but the semisweet chips keep it from becoming overpoweringly so. Preheat oven to 350. Line 2 cookie sheets with parchment paper. Place the sugar in a large bowl. Slowly stream in the syrup and then the applesauce. Mix until well combined and fluffy. In a small bowl, whisk together the salt, baking powder, baking soda, cocoa and flour. Slowly add to the batter and beat until well combined. Drop tablespoonful amounts on to the cookie sheet, spacing you have about 6 cookies per sheet. Flatten them slightly with the back of a spoon. Bake 12 minutes. They should look "set" but slightly shiny. Remove to wire racks and cool. Place one cookie on a plate, top with ice cream and another cookie. Repeat. *You can find this near pancake syrup or in the British foods section. 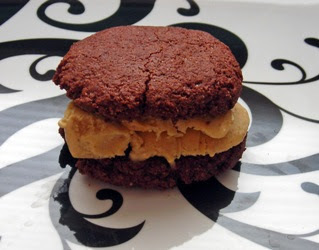 After trying the best vegan ice cream I've ever had (Wheeler's Black Label) which is not only good vegan ice cream but one of the best small batch ice creams I've had period, I was inspired to make some vegan sandwich cookies. 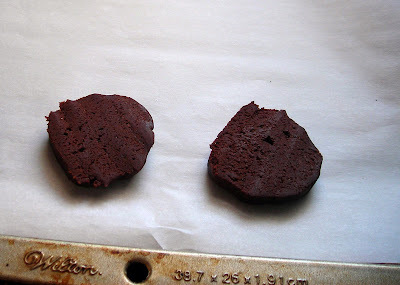 The cookies are super chocolatey and are a perfect foil to almost any flavor ice cream. My favorite to use was their peanut butter ice cream which was perfectly creamy and lacked that grainy, over powering feeling I generally find in peanut butter ice creams. Normally when I make cookies for ice cream sandwiches, I roll out the dough and cut it into the appropriate shapes. 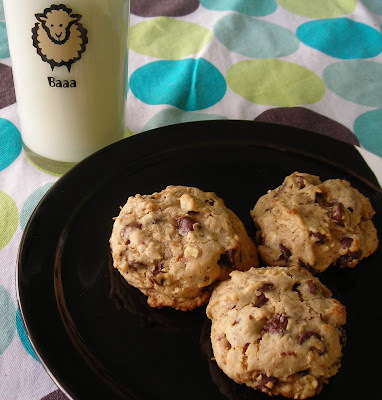 Drop cookies are much quicker to make and since they tend to be thicker, add more chocolate cookie flavor than you normally have without being overwhelming or difficult to eat. These cookies are also good plain, iced or with regular ice cream. Preheat oven to 250. Oil one 11x7 baking dish OR one 8x8 dish and one standard loaf pan. In a saucepan, heat the condensed milk. Add all of the dry ingredients and stir to thoroughly mix and evenly distribute all ingredients. Pour the mixture into the prepare pan(s) and flatten with a spatula or the back of a spoon. Bake for about 65-70 minutes or until the mixture looks dry and is only slightly sticky to the touch, but not browned. Remove from oven and allow to cool completely in the pan. Use a spatula to remove the entire contents of the pan to a cutting board and then cut into bars. Store in an air tight container. Breakfast bars seem to be big business these days. I honestly am not a breakfast person (bar or not) but I like the idea of having something solid and homemade to tuck in my bag as I go about my day. I had debated making straight up granola bars but couldn't find a recipe I liked. Everything called for lots of butter, sugar, honey or corn syrup and just seemed too sweet, sticky and possibly oily. Not to mention unnecessarily complicated. Then I saw mentions of homemade milk and cereal bars that used sweetened condensed milk (mixed with honey, sugar etc) and commercial cereals (like Cherrios). I didn't quite see the need to add extra ingredients and we don't eat boxed cereal so I went for a simpler approach. And you know what? It totally worked. Strangely, using sweetened condensed milk not kept the bars intact, and lent the bars a slightly caramel flavor, but the resulting bars were not overly sweet. They also had a richness to them (and a vanilla flavor) that belied the simplicity of the ingredients. And if you make them over the weekend, they will last all week. 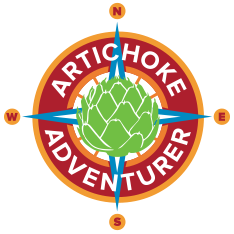 Just a few announcements before I get back to your regularly scheduled recipes. I am now officially a member of the Cookthinktank. Now some of my recipes (along with some from other fabulous bloggers) are available on Cookthink and are fully searchable by dish, cuisine, ingredient and even mood. The number of Coconut & Lime fans on Facebook keeps growing! Join them here. Nominations for the 2008 Bloggies are due in by tomorrow. After a lot of reader suggestions, I started a flickr group for Coconut & Lime where you can post pictures of food you've made using recipes from this blog. Join and post here. New Spring items are up on my Tupperware site. Directions: In a large skillet saute onion, garlic, ground beef, and chili powder until ground beef is slightly browned. Drain off any excess fat. Add all of the remaining ingredients. Reduce heat to the lowest setting and simmer, covered, for about 1 hour, stirring occasionally. Then remove the cover and simmer for an additional 1/2 hour or until most of the liquid is absorbed or evaporated but the mixture is still a little runny. Remove from heat. Arrange spaghetti on plates. When people think of chili, most people think of Texas. But did you know that Cincinnati has more chili parlors per capita than any other city in the US? While I've never had the good fortune to visit Cincinnati but I love their unique style of chili. 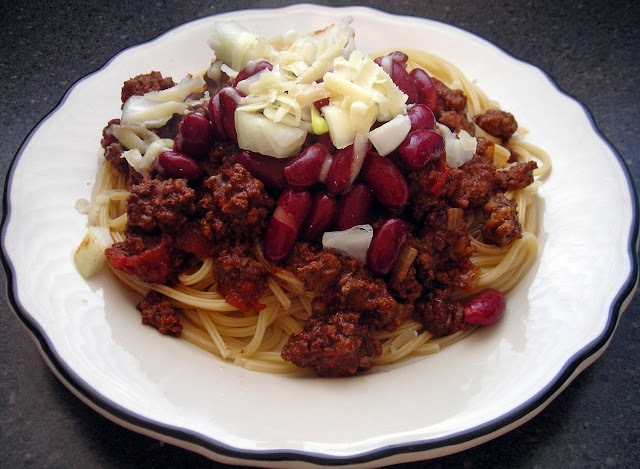 Cincinnati chili is basically a thin chili (almost more of a meat sauce) that is flavored with some unusual spices for chili, namely cinnamon, cocoa, and allspice and is served over cooked spaghetti. You can buy flavoring packets to make it, but it is almost as easy to make your own. Not to mention how difficult it is to find those packets outside of the immediate vicinity of Ohio. After some experimentation, I think I've cracked the Cincinnati chili code. It did require some research; I read dozens of old newspaper articles about the chili (Greek immigrants Tom and John Kiradjieff began serving this chili in 1922 at their hot dog stand the Empress which explains the oddly Mediterranean flavor of the chili) and read dozens of recipes, the majority of which were either conflicting or not very well written. Beyond a basic agreement on spices, there are some disagreements about the best way to make Cincinnati style chili. Some of the various conflicts include boiling the meat vs. sauteing (I find that sauteing the meat yields a meatier tasting chili while still maintaining a "loose" texture), whether to use diced tomatoes or tomato paste or tomato juice or tomato sauce (diced has a better flavor and the pieces almost melt away during cooking), if onions belong in the chili or just on top (again, the onions add flavor and nearly melt away), whether to use chopped chocolate or cocoa (I think cocoa mixes in better), some recipes use broth and others cook the chili for 3 or more hours (hard to keep all the liquid from evaporating). 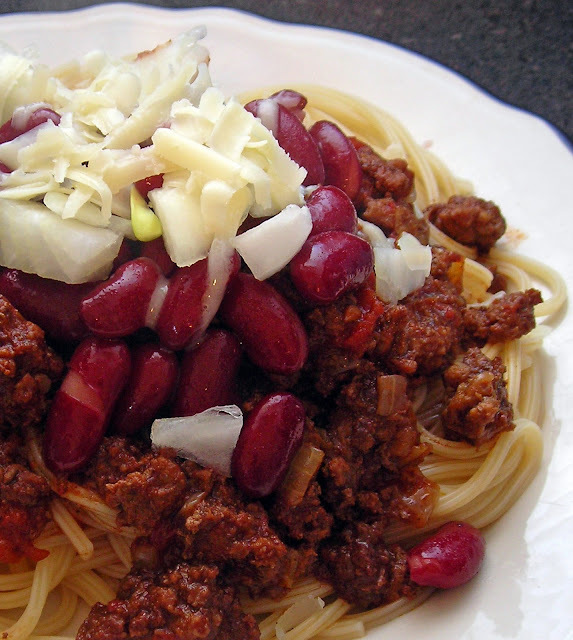 There is also a purported 6th way of serving: spaghetti, beans, chili, cheese, onions & sour cream. Despite there being more ways to make it then there are citizens of Cincinnati, I've come up with this "master" recipe which I think yields the best result of all of the methods I tried with the strongest, truest flavor. Can't get enough? Make this slow cooker version, Cincinnati Chili Mac and even Cincinnati Chili Dogs and Cincinnati Chili-Inspired Sloppy Joes. For the béchamel: In a medium pan, melt the butter. Add the flour along with a sprinkle of nutmeg, salt and pepper and stir until smooth. Add the milk and evaporated milk and whisk together until slightly thickened. Whisk in the asiago and cheddar until smooth. Pour over the drained pasta. Add the rapini and stir to evenly distribute. Pour into lightly oiled baking dish. Top with a sprinkle of parmesan and panko. Bake covered about 15 minutes, then uncover and cook until hot and bubbly, about 10-15 additional minutes. *Having the milk at room temperature or slightly warm helps keep the butter from hardening when you make the sauce. **A little trick: I steamed the rapini (AKA broccoli rabe) in a mesh basket over the pasta while it was boiling. What is it about winter that just cries out for mac & cheese? I don't normally go the whole creamy cheese sauce route but Matt had a craving so we went for it. Using evaporated milk gives the sauce a very creamy feeling but has a fraction of the fat in heavy cream. I'm always looking for ways to incorporate vegetables into things like macaroni and cheese, especially when it is serving as our entree. Rapini might not be the first thing that comes to mind when you think of macaroni and cheese but it worked well, rapini's strong flavor was tempered by the cheese and it kept the dish from being too one dimensional. 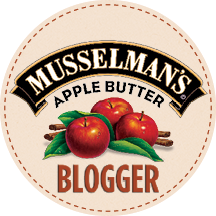 Place all ingredients in a food processor or blender, pulse until a thick paste forms. Toss with 1 lb cooked pasta. I wish we called arugula rocket here. It just sounds more interesting to say that you had rocket for lunch than arugula. 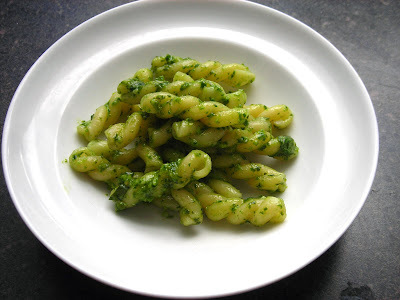 No matter what you call it, it makes a great peppery alternative to basil in pesto. It also doesn't turn brown as fast as basil does once cut, so I like to make some for dinner (or lunch) and make enough extra to have the next day. Place all ingredients in a large bowl and mix to evenly distribute ingredients. It is easier and quicker to mix it in a stand mixer using the paddle attachment, but it can be done by hand. Refrigerate overnight for best flavor. This dip started out as my take on the traditional Green Goddess Dressing which was created to celebrate the William Archer play The Green Goddess but in actuality there is only a passing similarity. Both use sour cream, chives and lemon juice but this dip is much creamer and is anchovy-free. I used green onions because I had some especially beautiful ones on hand (the chives were great too, despite it being the dead of winter) and I added some celery seed because it is quite possibly my favorite flavor. The result is very fresh and green tasting. I like to dip veggies in it or spread it on crackers but my absolute favorite way to eat it is on broiled or fondue-d mushroom caps. Time warning: this is best done the night before you want to use the stock. Place all of the stock ingredients in the largest stock pot that you have. Cover them with water, bring the stock just to the boiling point and then lower the heat. Simmer on low for 4 hours, periodically skimming the scum that rises to the surface. Strain stock and discard solids. Strain a second time through a strainer lined with a cheese cloth. If you do not have a cheesecloth you can also line the strainer with a damp paper towel. This is very effective but also more time-consuming. Refrigerate the stock until cold (preferably overnight) and then skim off any solid fat that floats on top. 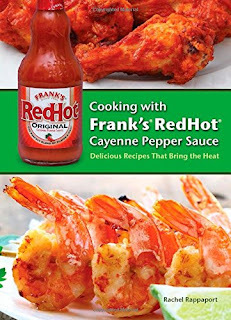 Optional but suggested: After you fill your fondue pot, add some extra flavor that compliments the flavors of the food and the dipping sauces. For example, we were having dumplings so we stirred in a couple of tablespoons of shaoxing wine, a splash of black vinegar, some sliced green onions and a drop of black sesame oil. Make sure your fondue pot isn't filled past the max fill line before heating. It is important to wait until the broth is quite hot (steaming, starting to bubble) before dipping the raw food or it will take an inordinate amount of time to cook anything and you run the risk of taking the food out before it is thoroughly cooked. Place the raw meat and seafood on a chilled plate. Arrange everything else in small bowls. Spear the food with your fondue fork and cook 1-4 minutes or until the food is cooked thoroughly. Remove the food from your fondue fork and use a regular fork to dip the food in sauce (optional) and eat. Resist the urge to eat off of the fondue fork, while the food you are eating is cooked, the rest of the fork has some into contact with raw food. I suggest having a separate plate where you can "test" foods you're not sure about to make sure they are cooked thoroughly, this helps cut down the risk of cross contamination. *Check the max fill line on your fondue pot. This recipe will most likely yield more stock than you can use. I suggest freezing the leftovers to use the next time you need stock. ** If you cannot find heads-on shrimp, you can use just the shells. However heads impart a lot of flavor. We get ours at an Asian grocery. Just cut off the heads and save the shrimp to dip in the broth. Last year we started a new tradition. On New Year's Eve, eat only food introduced in a certain decade and watch movies from the same era. Last year it was the '80s and I made poke cake and pesto pizza with sun-dried tomatoes. Working backwards, this year it was the '70s and we made fondue and California rolls (invented in CA during the 1970s). Fondue had been around for years before the 1970s but that is when it really took off in the US, especially the brothy, non-dessert, non-cheese fondues. The popular Melting Pot chain of fondue restaurants opened in 1975. Anyway, Matt spent most of Sunday making the broth and then today I stirred in the final ingredients and assembled the dips and dippers. I love fondue because not only is it fun and interactive, it requires little prep. No cooking before you eat, just setting up and if you make the broth the day before (or use broth leftover from something else) there is virtually nothing to do the day you fondue. And it is super easy to eat while watching a slew of '70s movies. Some tips: Making the broth and then flavoring it seems like a lot of work, but it is worth it. Even with the dips, the actual food you eat can be on the bland side if it is not cooked in a flavorful broth. I also recommend buying a fondue pot that can actually cook the broth and not the kind that just has a candle underneath to keep things warm. The tealight kind is cheaper, and the candle might work okay for keeping chocolate or cheese fondue liquid and warm but it really isn't powerful enough for an oil or broth fondue. Even if cheese or chocolate fondue is all you've ever had or think you'll ever want to have, you might as well spend the extra $20 or so and get a good set with a more powerful heat source and just have the option of making a broth or oil fondue. It is also much easier (and uses less dishes) to just cook the food in front of you rather than heating it up on the stove and then transferring it to the fondue pot to keep warm. My set came with a metal bowl for broth fondue and a ceramic one for cheese and chocolate fondues and uses a burner to heat things up. It even has a rotating rack for dips. Unfortunately I haven't been able to find it online to show you, but there are a lot of good fondue sets out there. I've also heard some positive things about electric fondue pots but I'd be sure to get one that has a bowl that can be lifted out for cleaning.